Are you a US expatriate looking for a way to watch NFL this season? Or perhaps a sports fan outside the US & Mexico that has developed a love for the American version of pro football? With NFL Game Pass, as long as you live outside the United States and Mexico (and a few other territories) you can watch every game live online this season. Restrictions: NFL Game Pass is only available to users located outside the United States, Mexico, Bermuda, Antigua, the Bahamas, and any U.S. territories, possessions and commonwealths including American Samoa, Guam, Puerto Rico and the U.S. Virgin Islands. What do you get with NFL Game Pass? There are two different subscription options, basic and premium. The Basic subscription includes: access to live 2011 Preseason and Regular season games, DVR controls, Big Play Markers, live scores and stats, chat, and archived 2011 games. Access to archived games is only available for 24 hours after the conclusion of each game. NFLDownUnder.com has put together a great review of Game Pass if you are looking for a little more information into how it all works. The layout and features of the video player look to be virtually identical to that of NFL Game Rewind, which we reviewed and love. 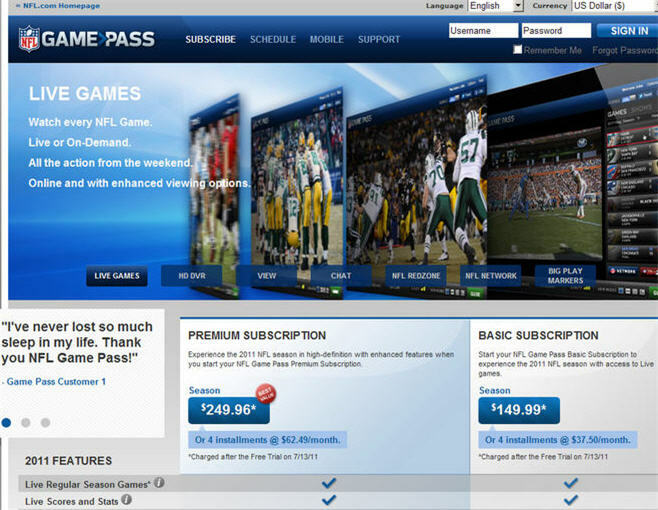 For more information see the NFL Game Pass FAQ, or order NFL Game Pass here from NFL.com.